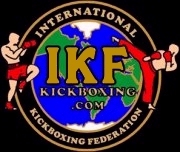 IKF Judges: Bruce Rasmussen, Susan Thomas-Gitlin & Alternating Referees. Judge Vichai Supkitpol "Rex": 30-27. Defeated Emelia ( Mia ) Dugger (Sacramento, California, USA, 0-1, S: 2, 63, 4'3'', 7-22-07, Garrett Dugger, (916) 296-3127, - (FP: 9-14-15) - (RN: 10-10-16) - (LU: 3-20-16) by doctors stoppage at :31 seconds of round 1. Emelia ( Mia ) Dugger has been issued a 30 day NO TRAINING & 30 day NO COMPETITION until April 19th, 2016. Judges: Susan Thomas-Gitlin, Bruce Rasmussen & Vichai Supkitpol "Rex". Judge Susan Thomas-Gitlin: 29-28 Ibarra. Judge Bruce Rasmussen: 29-28 Jimenez. Judge Michael Rinaldi: 29-28 Jimenez. Judge Susan Thomas-Gitlin: 29-28 Vongsavanh. Judge Bruce Rasmussen: 29-28 Saludares. Judge Michael Rinaldi: 29-28 Saludares. Defeated **Emily Rocha (Cottonwood, Arizona, USA, 1-1, 95, 5'5", 8-1-02, Guillermo Briseno, (928) 830-6446, - (FP: 3-8-16) - (RN: 3-19-17) - (LU: 3-20-16)) by TKO at :31 seconds of round 2. Emily Rocha has been issued a 30 day NO TRAINING & 30 day NO COMPETITION until April 19th, 2016. Judge Susan Thomas-Gitlin: 10-9 Stephenson. Judge Bruce Rasmussen: 10-9 Stephenson. Judge Vichai Supkitpol "Rex": 10-9 Stephenson. Judge Susan Thomas-Gitlin: 47-46 Almarinez. Judge Bruce Rasmussen: 48-45 Almarinez. Judge Michael Rinaldi: 47-46 Harara. (*) Both Fighters were given point deductions by Referee Vichai Supkitpol "Rex" for low Blows. Judge Vichai Supkitpol "Rex": 29-28. Judge Susan Thomas-Gitlin: 30-27 Hernandez. Judge Bruce Rasmussen: 29-28 Robles. Judge Michael Rinaldi: 30-27 Robles. Defeated Ramona Telmo (Vacaville, California, USA, 2-3, 103, 4'11", 3-19-88, Marlon Telmo, (707) 386-6211, - (FP: 1-18-16) - (RN: 1-30-17) - (LU: 3-20-16) by Unanimous Decision. Judge Vichai Supkitpol "Rex": 29-27. Defeated Joseph Saephan (Richmond, California, USA, 0-1, S: 4, 153, 5'6", 10-6-95, Cheetah, (510) 301-8012, - (FP: 9-11-15) - (RN: 9-12-16) - (LU: 3-20-16)) by TKO Injury stoppage. Joseph Saephan has been issued a 180 day NO TRAINING & 180 day NO COMPETITION for possible Left Knee Fracture until September 17, 2016. Must be cleared by an MD before allowed to compete again. Saephan was transported to Hospital by Ambulance. Judge Susan Thomas-Gitlin: 10-9 Davis. Judge Bruce Rasmussen: 10-9 Davis. Judge Vichai Supkitpol "Rex": 10-9 Davis. Judge Susan Thomas-Gitlin: 30-27 Fernandez. Judge Bruce Rasmussen 29-28 Fernandez. Judge Michael Rinaldi 29-28 Engel. Ryan Spellman has been issued a 180 day No Training & 180 day No Competition Medical Suspension by Dr. Mitch Jelen until October 19th, 2016. Possible Left shoulder fracture. Must be cleared by an MD or DO before allowed to fight again. Judge Susan Thomas-Gitlin 49-46 Alvarez. Judge Bruce Rasmussen 49-46 Monroe. Judge Michael Rinaldi 49-46 Alvarez.